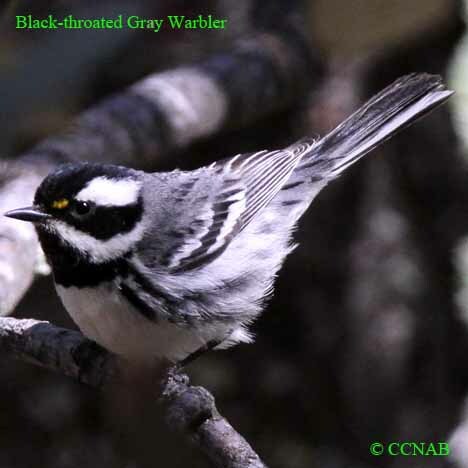 Species: The Black-throated Gray Warbler (Dendroica castanea) is found in the mountains of western North American. 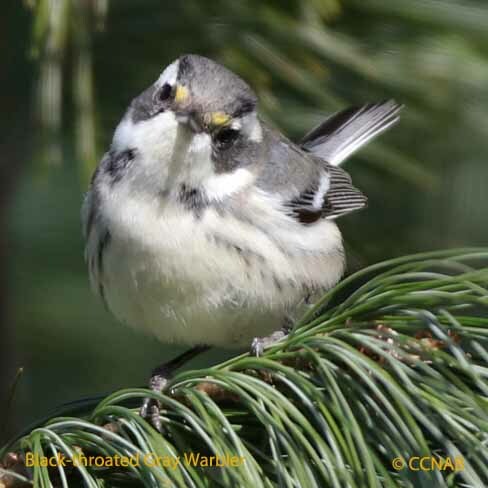 This warbler can be seen low in the shrubs or high in coniferous or deciduous trees. It adapts well to the moderate weather conditions of British Columbia or the hot dry weather conditions of the sky island mountains of Arizona. 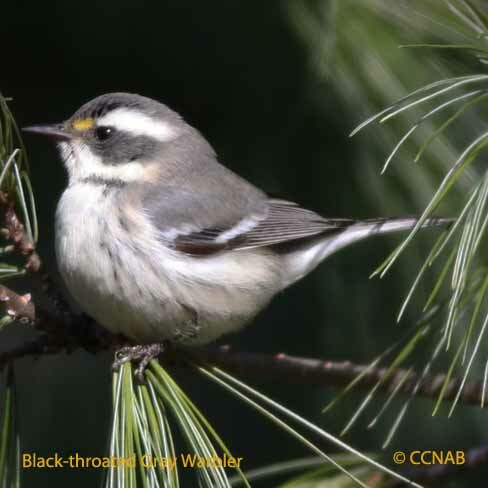 Is a known visitor in small numbers to areas of eastern North America in late fall during its migration periods. 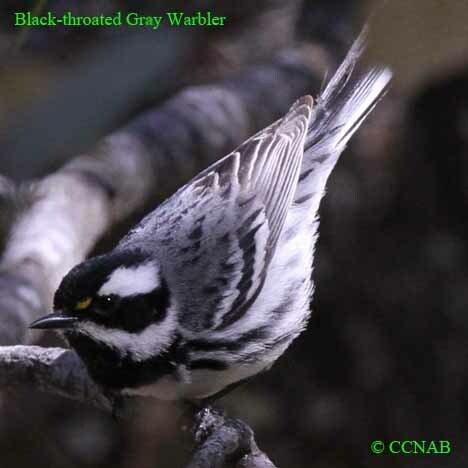 Similar to the Black and white Warbler, but does not share the same territories in North America, and has a different foraging style. Also, has some similarities to the Blackpoll Warbler, but again, does not share the same regions in North America. Distinctions: The male and female share similarities. 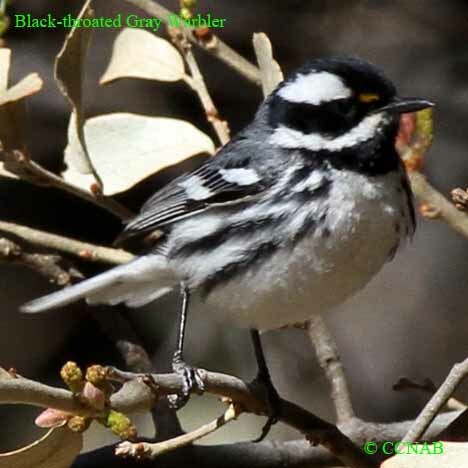 The male has a black crown, cheeks, throat and black streaking on its flanks, its back is gray with black stripes, black tail with white showing on the outer edges. Both sexes have an yellow lores, but only an area in front of their eyes. Both sexes also have prominent white superciliums and two white wing bars and white under tails. The female and juvenile may have a slightly black throat, or none at all, they will also have streaking on their flanks. The female and juveniles will have more gray showing overall, rather than black. Voice: Chipping call, slow and heavy notes, songs sound like "buss see", repeated over and over by continuous calling. Nesting: Three to five white to creamy coloured eggs with brown markings. 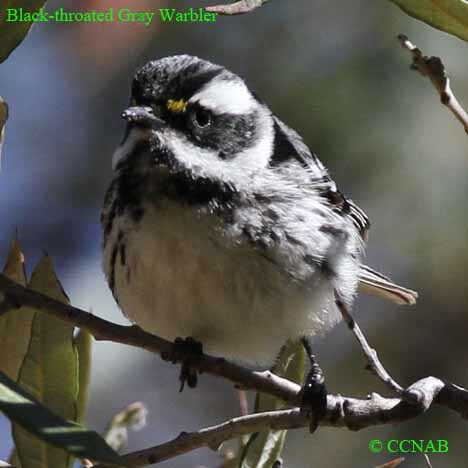 Prefers to build it nest in a dry area, might be found in a deciduous or coniferous forest,chaparral, scrubs,oak or pinon woodland. The nest is composed of leaves, mosses, and lines with fine grasses and hair. Distribution: Found on Vancouver Island and the southern regions of British Columbia, south through the mountain regions to southern California, east to New Mexico, except portions of California and western Arizona and north to Colorado. Spends its winter in Mexico and Central America.